Bogged down in Sherlock Holmes, Iron Man and other Marvel franchise movies, you can see in Robert Downey Jr’s eyes that he clearly had a ball making such a rounded, heartfelt family drama at this. Coutroom movies were big business in the John Grisham 1990s’ era, but this film is cleverer than most. It dips in and out of legalities to explore topics from sibling rivalry, memory loss and career ambition to the nature of criminal intent and estranged children having to care for the elderly. Now 83, the great Robert Duvall (The Godfather) would not be embarrassed to receive a seventh Oscar nomination as Judge Joseph Palmer, charged with murder after the death of a previously-jailed killer. Special prosecutor Dwight Dickham (Billy Bob Thornton) is drafted in to secure a conviction and Joseph chooses local defender CP Kennedy (Dax Shepard) rather than his son to represent him. “Your honour, I’m going to fight like a badger for you,” pledges Kennedy, whose inexperience in front of presiding Judge Warren (Ken Howard) convinces Hank that he needs to take charge of the case. After a slow start, the film’s twists and turns make The Judge increasingly engrossing both inside and outside of the courtroom as Hank tentatively rebuilds bridges with his two brothers, Glen (Vincent D’Onofrio) and Dale (Jeremy Strong), and father, who has been the community’s venerable judge for 42 years. And is he wise to consider reconnecting with old flame Samantha Powell (Up in the Air star Vera Farmiga)? 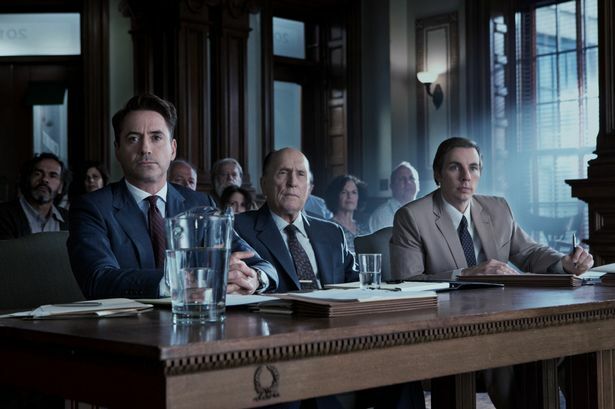 It’s all beautifully shot by Oscar-winning cinematographer Janusz Kaminski wand the now 49-year-old Downey Jr is right at the top of his game and worthy, perhaps, of a third Oscar nomination himself after Chaplin (1993) and Tropic Thunder (2009). Director and co-writer David Dobkin doesn’t end the 141-minute film neatly, but you’ll appreciate a story that stirs your emotions.